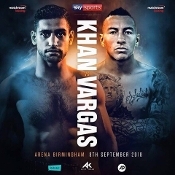 Includes Jason Welborn vs. Tommy Langford II, Ryan Kelly vs. Kelcie Ball & Sam Eggington vs. Hassan Mwakinyo. Includes San Dodd vs. Tommy Coyle, Conor Benn vs. Chris Truman, Tasha Jones vs. Taoussy L'Hadji & Sam Eggington vs. Achilles Szabo. 2 Blu-Ray Set with 24/7 + Much More. Also: David Lemieux vs. Glen Tapia, Mauricio Herrera vs. Frankie Gomez & Patrick Teixeira vs. Curtis Stevens. Includes Bryan Vasquez vs. Javier Fortuna. Includes Keith Thurman vs. Leonard Bundu & Abner Mares vs. Jose Ramirez. Includes Amir Khan vs. Julio Diaz & Peter Quillin vs. Fernando Guerrero. 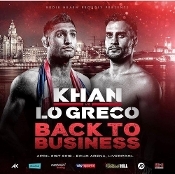 Includes Amir Khan vs Paul McCloskey. Includes Victor Ortiz vs. Lamont Peterson. Includes Victor Ortiz vs. Nate Campbell.